It's been a long time coming, but the next game by the co-creators of Call of Duty is finally here. 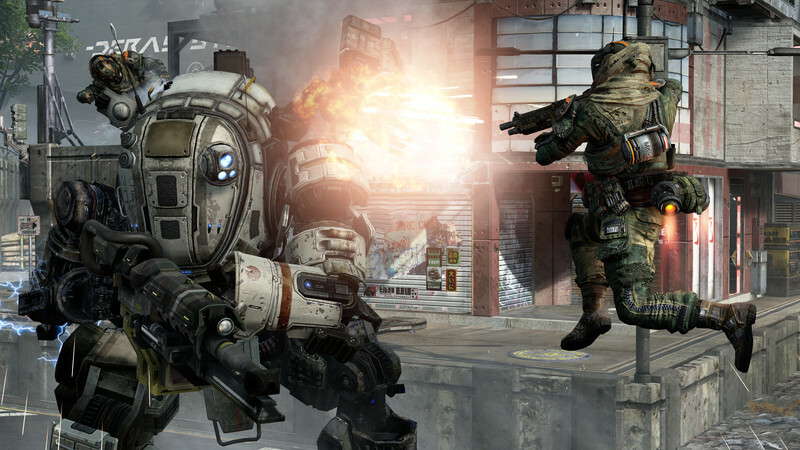 Matt Maguire suits up and goes hands-on with Titanfall. Titanfall is videogame as highlight reel. A six-on-six mech-heavy shooter from the creators of the ground-breaking Modern Warfare series, it energises the long-stagnant competitive FPS genre with a heady mix of twitch shooting, breakneck parkour, and battlebot badassery that makes all others seem positively pedestrian by comparison. It borrows the best bits from expected places like Call of Duty, Halo, Tribes, and Mechwarrior, blends in a bit of Mirror's Edge and even Dota, then polishes and expertly balances those mechanics in a way that ensures strings of "Holy crap did you see that?" moments erupt every match. Doing anything in Titanfall feels awesome. Titans are the fearsome, fleshbag-stomping killbots they ought to be, and the percussive crash that heralds their arrival from orbit is always cause for celebration or panic. The way they scoop up and slam pilots into their cockpits is thrilling, and the second of so of black screen and rumbling before a Titan's HUD lights up and the AI control disengages lends a great sense to the player that they are at the helm of something both towering and destructive. Titans may be called in by every player every three minutes or so, but this time can be drastically reduced by killing enemies, capturing points on the map, providing assists, or killing the variety of fairly weak enemy AI grunts that are constantly spawning and roaming the map in teams. There are deeper systems at work here too: those within earshot will hear grunt chatter regarding enemy locations, and if unchecked the AI will aid with objectives. 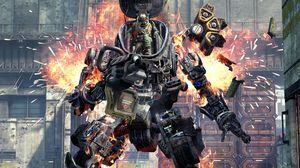 Robotic ones can be hacked to turn on their masters, as can the Titan-killing turrets on a handful of the game's 14 maps. It certainly pays to keep an eye on the minimap – if grunts are disappearing, enemies are close. 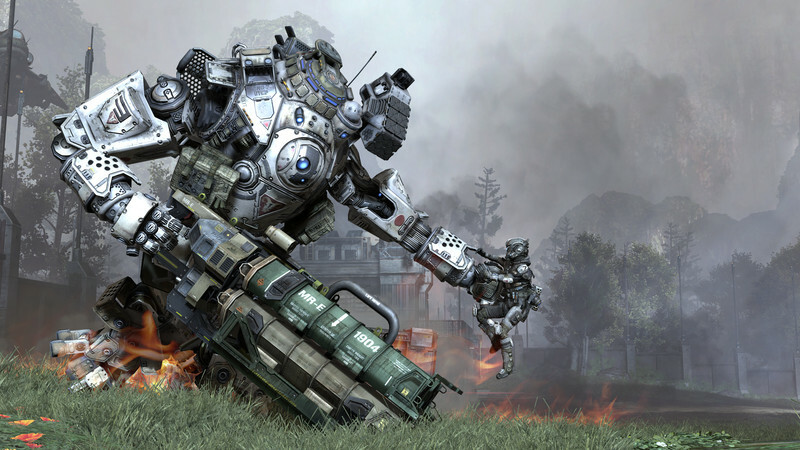 There are three basic Titan models – essentially tank, hit 'n' run, and balanced builds – but customisation options soon open up, with unlocks available for primary weapons, a secondary rocket-based ordnance, and a defensive tactical ability, as well as for kits which basically amount to perks. The three basic chassis types each possess varying amounts of armour, but also confer a different core ability whose cooldown is reduced by killing enemies, capturing points, and so forth. Here, the fast and agile Strider chassis gets unlimited dash for a brief time, while the more balanced Atlas gets a shield boost, and the tank-like Ogre a raise in damage output. Each chassis also comes equipped with recharging dash boosters, useful for quickly strafing behind a building to recharge shields, dodging a flurry of rockets, or running down a fleeing opponent. After chassis type, a Titan's tactical ability probably has the most effect on play style, and lends Titan-on-Titan battles something of a rock-paper-scissors vibe. Vortex Shield temporarily blocks incoming fire and allows it to be flung back at aggressors, Electric Smoke hides a Titan in an opaque cloud and damages others that walk through it (or outright killing pilots not in a Titan), and Particle Shield is pretty self-explanatory. All the above make Titan battles less outright frontal assault and more a considered chess match, wherein each player fakes, blocks, and jigs, trying to anticipate the next move of the enemy in order to unleash hell at the time they are most vulnerable. It's difficult to overstate how fun it all is, especially with a few stray pilots in the mix. Should a Titan's recharging shields be depleted and its armour totally compromised, it will enter a doomed state, wherein combustion is imminent. Here, the only real choice for pilots is ejection, although some last-second maneovrings can see an exploding Titan engulf nearby assailants. However, the risk for pilots of crippled Titans isn't just in being caught in the inferno. Weakened Titans expose their pilots, who can be ripped from their cockpits and mercilessly crushed by rivals. Obviously, galloping around in a two-storey-high mech bristling with such destructive potential is pure power fantasy, and woe betide any pilot caught in the open before these potent beasts. However, a pilot without a mech is far from helpless in cover, and depending on the player is anything from a thorn in the lion's paw to the proverbial David felling Goliath. Wall-running gives pilots a speed boost, and that combined with their jetpack-assisted double jump can see them easily evading a Titan while chipping away at it with specialised anti-Titan weaponry. There is another way to bring down a Titan as a pilot: the rodeo attack. Here, a pilot jumps from an elevated position onto the target mech and yanks off protective panels in order to shoot out its inner circuitry. It's a surprisingly quick way to disable a Titan, although while doing so pilots are exposed to others. If they don't have electric smoke, the pilot inside must disembark his or her protective shell and engage personally, making the rodeo another genius little minigame in a title filled with them. A Titan left completely to its own devices will attempt to defend itself, but presents easy pickings for opposing players. Even so, it's sometimes advantageous to leave one guarding an area, or simply trailing the player around for additional firepower. There is just the right amount of pilot customisation in Titanfall, with a limited number of meaningful and distinct choices to be made rather than dozens of meaningless ones. 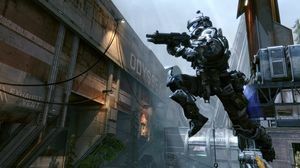 The most interesting decisions revolve around tactical abilities and perks, some of which can boost parkour skills, show enemies on the minimap at regular intervals, or allow the player to be almost invisible to Titans for a brief period. 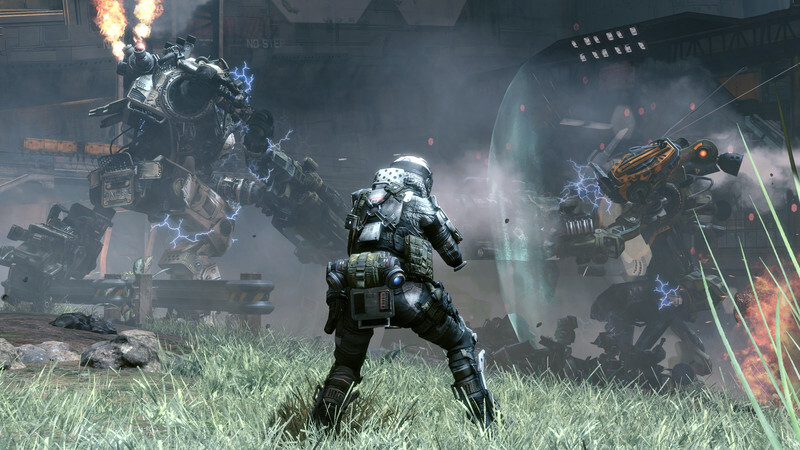 Even without Titans in the mix, Titanfall's kinetic combat would satisfy. But throw those mechanical monstrosities in the mix and thrilling games of cat and mouse result, with stories of death-defying stunts and destruction quickly offered after every round. That a pilot's melee attack can be a flying kick should indicate what's being aimed for here: adrenaline-filled scraps on scales both small and vast. The best part is that regardless of how a match goes, there's always the opportunity for last-second heroics thanks to the game's epilogue mechanic. 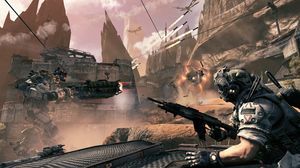 Upon a match's victory condition being met, one team will be prompted to evacuate at a certain point while the other is tasked with stopping them – even if it means destroying the heavily armoured dropshop en route for extraction. A timer ramps up the tension as players try to see a way through a wall of hungry enemies to freedom and extra XP. It's basically Counter-Strike, but on a very short fuse and where everyone knows where everyone else is going, and it's outstanding. In fact, Titanfall is outstanding all-round. Little has been said here about the campaign as it adds little and is hard to pay attention to in the middle of a firefight, but its inclusion certainly doesn't harm the game. It would in fact be a virtually flawless game inside and out were it not for one thing: server support. We played the game in perfect conditions, but lag could be a problem for Australians until Microsoft's Azure server array opens in Australia, which is rumoured to be happening sometime in the second half of the year. As it stands, the closest data centre is Singapore, and that may render the game unplayable for some connections. There were also some lobby issues during our review time with the game, although Microsoft's latest patch should have sorted those out by launch. 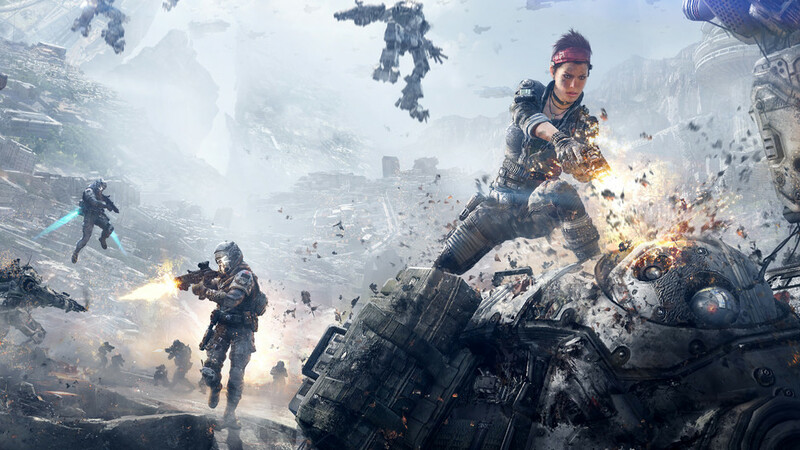 Naturally, the spectre of SimCity and Battlefield 4's problematic launches also hangs heavily over Titanfall. However, there is no denying that this is an engrossing title full of nail-biting clashes that nonetheless is an attractive title for newcomers. 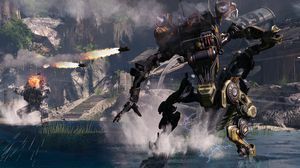 A lack of Killstreak rewards means things are never lop-sided the way Call of Duty can be, and besides – regardless of how terrible you are, eventually you will get a giant mech to charge around in. It's an absolute heap of fun, and the first new-gen game actually worth buying a console for. 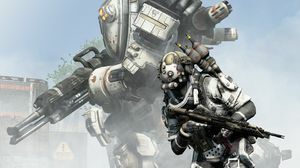 Titanfall is the game Microsoft's new-gen console has been waiting for: a fast, frenetic mix of parkour gunplay and agile mech combat that makes for an incomparable shooter experience. Ups Design that empowers the player to feel like a badass whether on foot or in a Titan. Meaningful customisation. Downs Lag may be an issue for local players. We check it out at TGS.